This represents an evolution in thinking for Microsoft. Ignite this year has a heavy focus on artificial intelligence and machine learning and it’s clear that Microsoft thinks it’s how we’ll realize the next step in technological advancement. 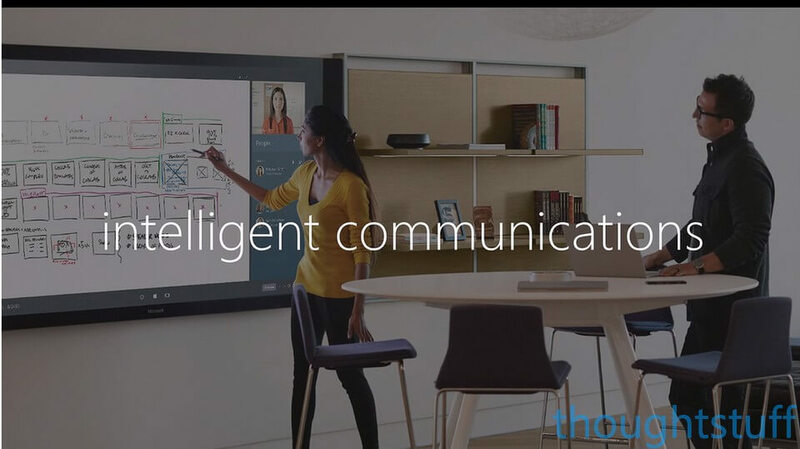 But what is Intelligence Communication, what does it mean for Skype for Busines, Microsoft Teams and for those of us that develop on these platforms? I think we’ll see more about this in the next few days, but this is my take. Intelligent Communication is about communication that is more than an icon on a desktop. Intelligent Communication is a fusion of the right data, with the right people, at the right time in order to achieve results. Intelligent Communication is the combination of multiple data sources, plus collaboration. Intelligent Communication will be how we take the vast amount of data available to us, and make sense of it. Intelligent Communication is the fusion of the data and information that is created when humans meet, combined with Microsoft’s most cutting-edge Artifical Intelligence. Because Intelligent Communication is about more than just using a communication tool to communicate, integration into, and aggregation of, different systems, data, and processes are necessary. These cannot be done by Microsoft alone – data and processes live in a myriad of third-party systems and applications. Taking this information and bringing it to one place for the overall betterment of the whole system: this is where Microsoft needs developers. In fact, Microsoft cannot achieve their stated goals without you. 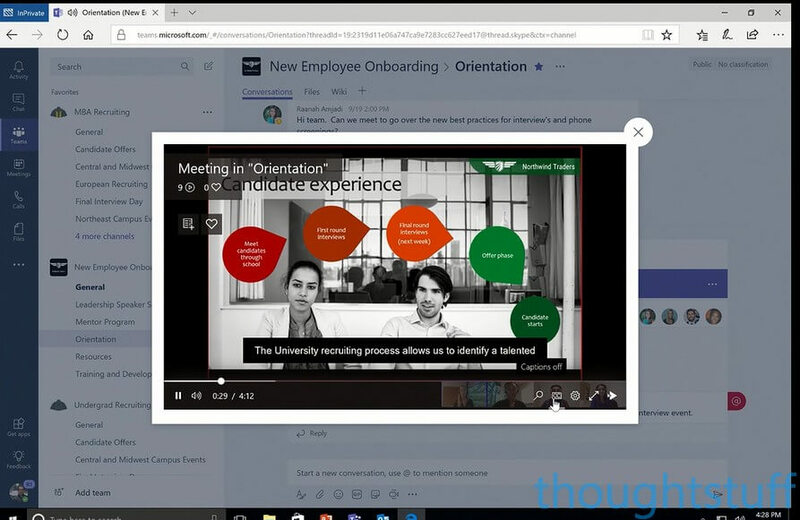 It’s unlikely that you missed the news about Microsoft Teams evolving to be the primary communication client in Office 365, but what does this mean for developers? The reasons that Microsoft have made a decision to move forward with Microsoft Teams are the same reasons that developers should be encouraged and excited by the possibilities which are opening up. Microosft Teams is an all-new service: less than 6 months in GA, less than 12 months since Preview. It’s been written from the ground-up to excel in the world we find ourselves in: occasionally connected, mobile, on-the-move, working on several things at once. At the same time, it’s been designed to take full advantage of the Microsoft Cloud and all that it can do. It’s perfectly placed for Microsoft to realise some of the most ambitious and audacious Intelligent Communication breakthroughs. That’s something which can only really be done with the scale of the Cloud and the intelligence of Microsoft Cognitive Services. By building with these services in mind, Microsoft Teams can make these evolutions possible faster and more capable than was previously possible. The great news for developers is that Microsoft knows that Teams needs to be extensible, if people are going to use it, and it will only be a success if it becomes the central point of information collaboration. That drives Microsoft to provide good developer tooling, and they’re not disappointing us with the breadth of different ways to develop on Microsoft Teams today. Act Now: Keep up to date on Microsoft Teams development tools by bookmarking my mini-site. One of the reasons that customers may choose to stay using Skype for Business is the range of development options, and how those development tools allow nearly complete control over how your Skype for Business deployment operates. It’s a level of control and customisation which would never be available in a SaaS solution such as Microsoft Teams, and for some people, they need that level of control. 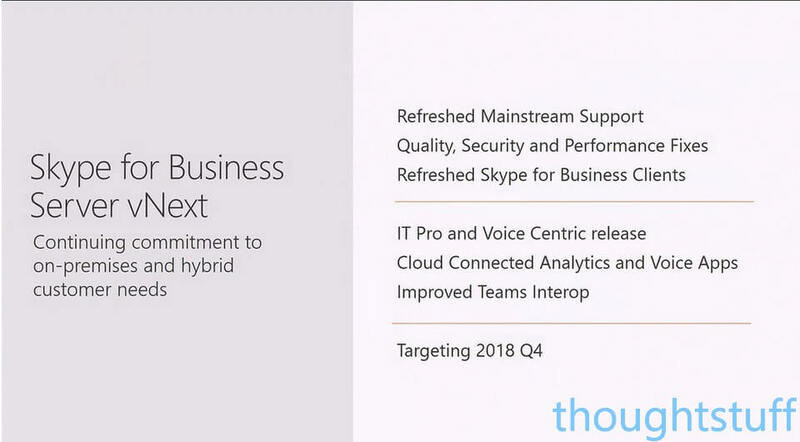 Skype for Business On-Premise will continue to be the place where development solutions can have the most impact on how the product operates day to day, and this should be considered as a factor in any decision about your future communications strategy. Over time some of the things which are only possible using development tools in Skype for Business will become possible in Microsoft Teams, so this is a decision which should be regularly re-evaluated over time. For developers, this is good news because investment and knowledge of SDKs such as UCMA and UCWA will continue to be relevant. Right now, it’s the best of both worlds. As a developer, choose to write applications for Microsoft Teams which bring together data and allow users to work more intelligently, or choose to write applications for Skype for Business to add extra value to on-premise deployments. Customers have a choice about what steps they take next. Developers have a choice about which paradigms they will write solutions for. Users have a choice about how they will communicate and get work done. Ultimately, choice is good for everyone. Confused / Want to Know More? Choice can be confusing though, and it can be hard to know what to do next. If you’re at Ignite 2017 check out the Modality Systems stand 1457 or tweet them @modalitysystems for a catch up. Otherwise, feel free to find me on Twitter – @tomorgan, or subscribe to my newsletter & weekly video updates.